Me and my kuchi ice. This blogging every day in January gig is proving to be harder every day. I have to wake up each morning and search inside my head to come up with something that’s even passable. It doesn’t help that its cold and dreary outside. No, something has to rain on my usual sunshine-y demeanor I’ve been informed that the cold weather will end only at the end of February, maybe even March. I am so ready for summer already. I loved summer holidays as a kid. Endless hours watching tv, playing with the apartment kids and scrumptious food provided my mommy dearest. You could say it was the perfect summer. But the one entity that had to dampen my spirits was the saravana Bhavan ice cream man. He would ring his little bell on his little vandi all the way to my street. I could hear the bell even at the far end of the house and would run as fast as my pudgy legs could carry me. There were times when I’ve even chased him down the street. We have all done things we are not proud of, so let’s not dwell on this? All this hullabaloo was just to get my hands on the best kuchi ice ever – the grape flavored kuchi ice from Saravana Bhavan. So delicious, so slurpy, I’ve been know to inhale it three at a time. Good for me that my mother had the same interest in kuchi ice that I did. But after a few years the losers at Saravana Bhavan decided to discontinue grape ice. And that’s where my story had to end. 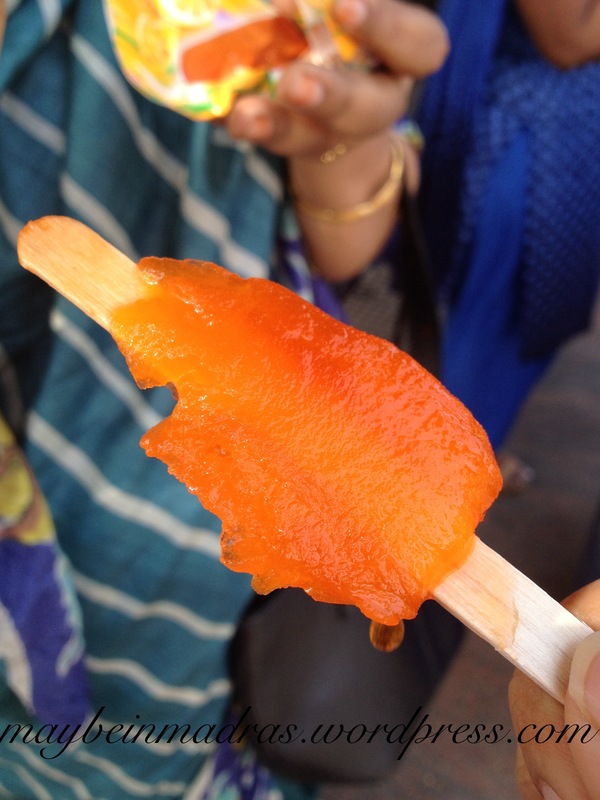 But it’s okay, I found the second best kuchi ice – Sravana Bhavan orange kuchi ice. Orange kuchi ice, outside Saravana Bhavan, with mother as the back drop. → Cold, outside and in my nose.